Welcome to the first in a series of book reviews which I call "Books That are not Worth Reviewing". The Squirrel Twins' Ride is the tale of two young squirrels - Chipper and Chatter - as they attempt to make their way through a cold and unforgiving world. They have been left alone while their parents travel to visit relatives. One day they receive a letter inviting them to rejoin their parents, and they eventually find themselves on a train, attempting to reach the house of their Aunt Maria. Unfortunately, they don't know where she lives, they have no tickets and presumably no money to buy them with anyway. It is unclear how they have been able to meet the basic requirements of survival, or who has been keeping their beanie hats spinning this whole time. On the train, the gruff Conductor and the thrifty Mrs. Mouse are their only source of hope, as they travel from town to town, hoping for a furtive glance of a place to call home. At each stop, the Conductor asks if anyone is looking for two squirrels. It's clear that the Conductor cares only for himself and the duties of his position. He is desperate to unload the twins on the first owl, frog or turtle that will have them. The conclusion of the book and its bittersweet family reunion is short and to the point. Published in 1968 by Rand McNally as part of the 'Tiny Elf Library', it's evident that no one expected this book to survive until 2010. The binding is cheap and the pages are yellowed. We happened to find it at a library book sale a few years ago, and it's been a popular item ever since - mostly because the story is so bizarre. The book is written by Duncan Jury and illustrated by Eleanor Corwin. Corwin will appear again in future book review. This might be the only book published by Duncan Jury, and it's not hard to see why. It doesn't make any sense at all! The book is short so I have scanned it in and you can view it here. I don't have a lot of interest in violating any copyright, so if someone wants me to take it down, just let me know and I will. UPDATE: Eleanor Corwin passed away recently. And, as you can see in the comments below, I've managed to offend one of her children with this review. It's hard for me to strike a balance between humorously talking about a book which has been forgotten by time (otherwise, there would already be reviews of it), and offending people. Judging from the comments I've received on these reviews, that a small chunk of people are really angry with me, and a slightly larger chunk find them funny. That said, even when I do poke fun of books, I am really trying to honor the process of creation here. I spend hours and hours scouring the web for facts about authors, illustrators, publishers, and everyone involved in the creation process. I read the books over and over again, and I spend a long time writing and editing my review. I wouldn't do this if I didn't have a love and respect for the original creation. 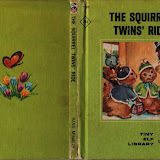 The review for Squirrel Twins' Ride was my first, and therefore probably my worst, and I'm sorry that my review does not adequately express my love for this book. My review doesn't mention the treasured place this book holds on my son's bookshelf, for example, or the fact that our family still reads it and talks about it, years after finding it at a library book sale. This is the first contact I've had from an actual author/illustrator or a member of their family, although it's something that I've been expecting for some time. In this case, it would seem that I've hurt some feelings, and for that I feel truly sorry.